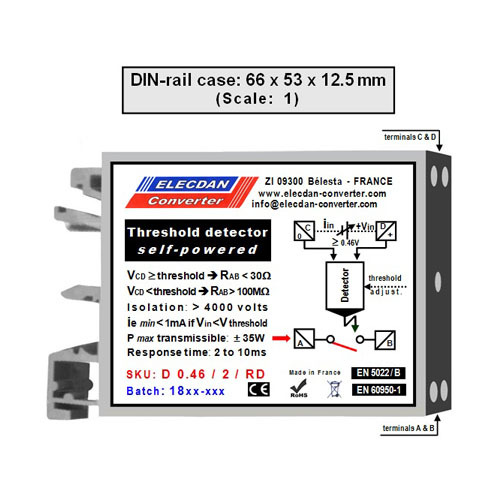 This threshold detector, self powered by the low voltage it controls, stands out by the “proper functioning” contact (isolated) that it can deliver from a voltage of only 0.46V. Ideal for the control or monitoring, occasional or permanent, of single elements such as individual cells of fuel cells or photovoltaic modules. In simultaneous monitoring of elements in series, these detectors are free from the reference of zero, while delivering a global information of logic type “AND”. Self-powered by the monitored input voltage Vin (0.46V to 2V and higher), this voltage threshold detector (0.46 to 2V) is a quadrupole that: simplifies wiring by removing power supplies, delivers a “proper functioning” contact, gets rid of referencing the electrical grounds. Examples of applications: to highlight weak cells, individually, on a hydrogen fuel cell (see diagram on the PDF datasheet), to detect an abnormal DV on a conductor. Equipped with an inbuilt adjustment axis (10 rounds / diameter 2.5 mm), this mini module delivers a contact, isolated from the input, as long as the monitored voltage exceeds the chosen threshold (from 0.46V to 2V). Whatever the setting of the threshold, in the range “0.46V to 2V”, the iin consumption of the detector remains below 1mA, as long as Vin has not exceeded the chosen threshold. Maximum allowed iin : 50mA. The absorbed energy is all the lower as the voltage threshold to be detected is high.